Isla was bred in Scotland when we were living there and was one of three beautiful puppies. She travelled to Canada with her brother Fergus just after they turned 8 weeks old and didn’t skip a beat. She is living with Lisa Harbidge of Spiritrider Farms and they love her to pieces. Lisa and I are co-owning Isla which is an exciting venture for us both. We are very excited about Isla’s future and she is becoming a cracking show dog. So far she has been awarded several Reserve wins, best puppy in breed, and a nice big blue rosette for Best Puppy in Group! Isla had one litter for me and produced some lovely babies. 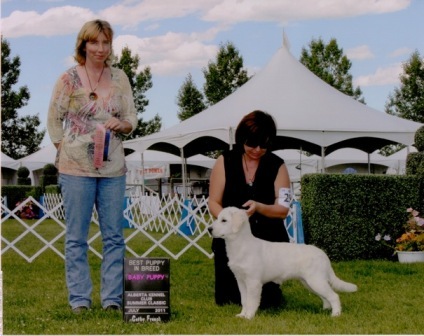 She also was bred by her co-owner and good friend Lisa Harbidge (Spiritrider) and had some lovely puppies with Lisa’s boy Beamer. Isla is now retired and living life as a much loved pet dog.